Winter-annual or biennial herb up to 40 cm tall Stem: very short at first, then becoming much-branched with branches loosely ascending or spreading, and hairy throughout. Leaves: alternate, short-stalked, hairy, 5 - 10 cm long, longer than wide, pinnately compound and fern-like. The overwintering leaves form a rosette. Inflorescence: axillary, long-stalked, umbel-like cluster of two to eight, small (under 2 cm diameter), short-stalked (1 - 2 cm), radially symmetric, pinkish to pink-purple flowers. 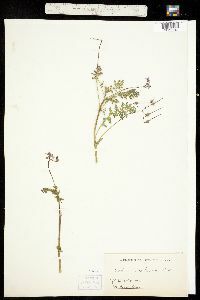 Sepals: five, alternate with petals, green, strongly veined, 5 - 7 mm long, fairly oblong but with an abruptly sharp pointed tip ending in a short bristle. Petals: five, pinkish, 0.5 - 0.8 cm long, inversely egg-shaped with narrowed base, widest at or beyond the middle, and rounded at tip. Stamens: ten in two series, but only inner five fertile with developed anthers. The remaining five sterile stamens are reduced to scales. Pistil: with a single, deeply five-lobed, superior ovary; one long, slender style column; and five short stigmas. Fruit: five, hairy, 2 - 4 cm long, single-seeded, nutlike segments per flower, each sharply pointed at base and ending in a long, spirally coiled (at least lower half), and hairy beak. Each fruit segment (nutlike base with beak) retains the seed inside, but separates completely from the style column and rest of the old flower parts. Leaflets: hairy, stalkless, 1 - 2.5 cm long, egg-shaped or oblong in outline but deeply divided into irregular segments. Similar species: Erodium cicutarium is somewhat similar to species of Geranium, but members of that genus always have opposite, palmately-lobed stem leaves, flowers normally in pairs, ten fertile stamens, rounded bases on the nutlike fruit segments, hairless beaks that coil up and remain attached to the style column (also with the nutlike segment attached), and bumpy or ridged seeds that are ejected from the fruit. Another species of Erodium that can also be found in North America is E. moschatum. This species escapes less frequently than E. cicutarium, but that species can be distinguished by its short-stalked leaflets that are less deeply cleft or only merely toothed, and the sepals lack terminal bristles. Habitat and ecology: Introduced from the Mediterranean area of Europe, an occasional weed of waste areas or cultivated grounds. Winter-annual or biennial; stems at first anthesis very short, with the lvs mostly basal, later diffusely branched, to 4 dm; lvs elongate-oblanceolate, the principal ones pinnately compound with several sessile, ovate or oblong, deeply and irregularly cleft pinnae each 1-2.5 cm; infls long-peduncled, 2-8-fld, the pedicels 1-2 mm; sep 5-7 mm, mucronate or shortly awned; pet off- pink, 5-8 mm; anther-bearing filaments without teeth; fr 2-4 cm; 2n mostly = 40 in ours. 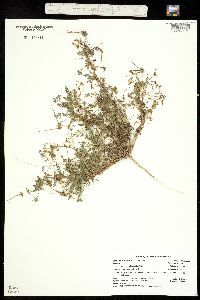 Native of the Mediterranean region, now established as a common weed throughout most of the U.S. Apr.-Sept.